Ten states and 2,500 miles couldn’t keep our Stellar Caterpillar Sayid from meeting his next motor milestone. Since Sayid lives on the east coast of the United States and Stellar Caterpillar is located on the west coast, his parents set him up for virtual lessons with Donna. After reading stellarcaterpillar.com Sayid’s mother learned to give him tummy time and taught him to scoot while on his back. Observe baby Sayid in the video above from KatMur’s youtube channel. As we watch the video we see some very well-developed motor skills. He lifts his head very high in tummy time and can stay on his tummy for quite awhile as he plays with toys. This develops strong back and neck muscles. He also learned the motor skill of rolling. We see him roll beautifully from his back to his stomach, and this allows him to reach the interesting objects that are near him. His grasping and reaching skills are very good, too. Sayid shows confidence– when he sees something interesting near him, he can reach out and grab it to examine it with his own hands. He also can pivot around in a circle to help him get closer to something that is a bit far away. 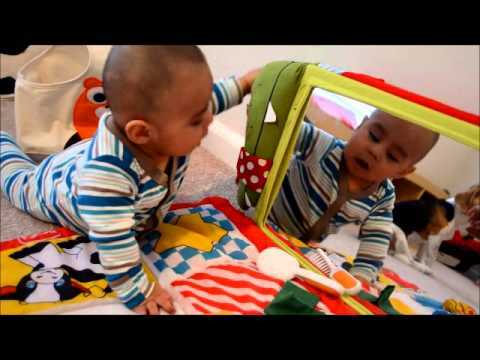 The motor skill of crawling will be much easier to teach Sayid because he has spent time in four Stellar Caterpillar Top 10 Motor Milestones: grasping and reaching, kicking, lifting the head, and rolling. These skills have strengthened his legs, arms, hands, back, and neck muscles as well as his bones. Through virtual instruction, we will guide his parents through a few simple exercises for daily practice so he will learn to crawl. Together we shall see Sayid’s progress is anything but virtual! To read about the next lesson, read Virtual Lessons for the Motor Skill of Crawling, part 2.